Write Protection adds another layer of defense to the computer. The system is not fool proof on its own, as it is still possible to copy data, for instance by uploading it to the Internet or a network connection. When you do this there is the error that you see while copying the data into the Pen Drive. Users who experience problems writing to USB devices might want to take a look at this setting as well if they have the proper rights to do so to see if it is the cause for their difficulties. Start by opening the run dialog box with the keyboard shortcut [Windows R]. Type [regedit] and hit [enter]. This should open the Windows Registry editor. 1- This will block write processes on USB Flash Drives. An alternative would be to delete the Registry key WriteProtect completely to enable both read and write processes. A restart or log off is required before the changes take effect. 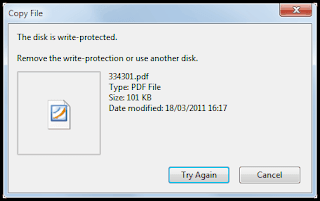 There are two Registry files to enable or disable write protection. You can download a zip file that contains both files here: click here.